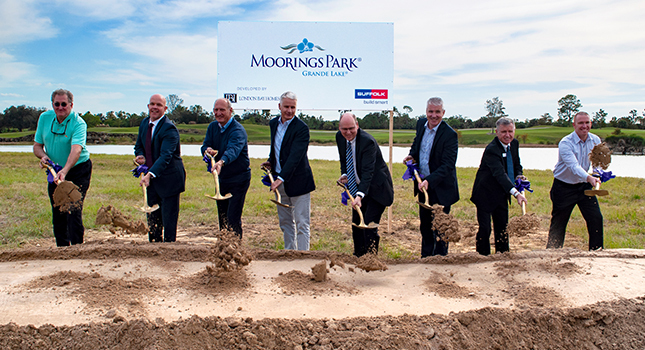 There’s exciting news coming from Moorings Park Grande Lake, Naples’ new Life Plan (CCRC) community being developed by Moorings Park in partnership with London Bay Homes. Late last year, construction began on the first three buildings that constitute Phase I. It consists of a total of 47 residences, of which more than half have already been sold. That noted, many spectacular residences with outstanding views remain available. There are many advantages to buying in Phase I, including receiving a social membership to Naples Grande Golf Club. The membership takes effect the moment residents take occupancy of their home and until such time as the Moorings Park Grande Lake Clubhouse is completed. The membership includes golfing privileges on the Naples Grande Golf Club’s 18-hole championship golf course, and dining options in Naples Grande’s elegant clubhouse, both located within walking distance of Moorings Park Grande Lake. In addition, residents have access to Naples Grande Beach Resort and its Har-Tru tennis courts, fitness center and spa, resort-style pool and beach, and preferred pricing on hotel rooms and dining. With the start of construction on Phase I and its continuing sales success, late last year Moorings Park Grande Lake also launched sales in Phase II. It consists of 23 residences in two residential mid-rise towers. Building F, with 12 residences, is located adjacent to the community’s clubhouse and overlooks a large lake with the golf course beyond. Building J, with 11 residences including one penthouse, is located to the west of the clubhouse and also offers views of the lake and golf course. One of the community’s boardwalks, which extends out into the lake, is located just outside the building. Except for the penthouse, all residences in both buildings are the spacious and open Brook floor plan. The three-bedroom plus study/three-and-a-half-bath home has 3,230 square feet of living area and 3,905 total square feet including a 675-square-foot lanai, which is accessible from the great room and kitchen area, as well as the incredible master retreat. Entrance fees start at $1.5 million and are 70 percent refundable. Assisted Living, Memory Care and Physician Services are included. 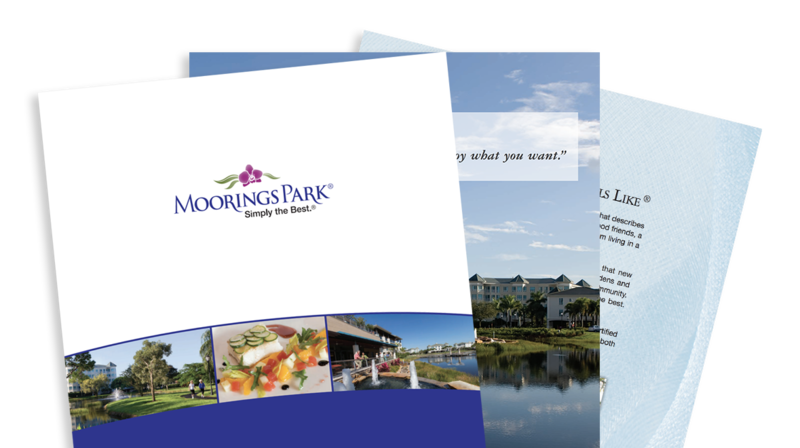 The Moorings Park Grande Lake Sales Gallery is located on Premier Drive, on the south side of Golden Gate Parkway, between Airport-Pulling and Livingston roads, inside the entrance to Naples Grande Golf Club. Call 239-919-1620 or click here to learn more about Moorings Park Grande Lake. Want to learn more about Moorings Park and our three stunning campuses? Schedule a visit to see for yourself.